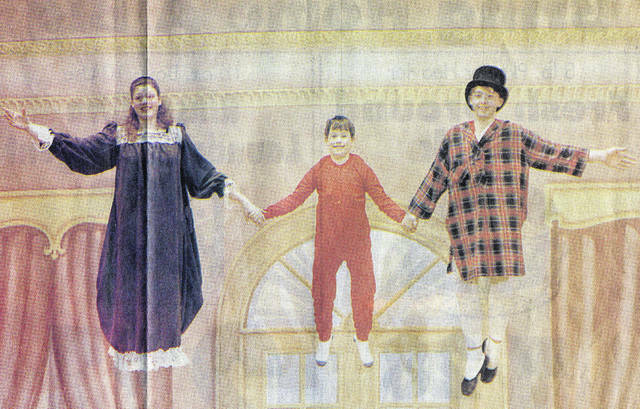 Jill (Westerheide) Larger, left, flies above the Sidney High School stage as Wendy in a 1994 Sidney Dance Company production of “Peter Pan.” Also pictured are Michael Eikenberry and Jason Henschen. SIDNEY — At the end of June 2018, Sharon Eikenberry, founder of the Sidney Dance Company, quietly slipped out of its artistic directorship and onto its board of trustees. It’s a move she had planned for almost a decade. “I’ve waited for 10 years for the person who will take the company where it is and grow it, who has the love of the art, the passion for the students and the dedication outside the studio,” Eikenberry told the Sidney Daily News, recently. She found that person in Molly McFarland, of Tipp City. McFarland is now artistic director of the company Eikenberry founded 39 years ago. And Eikenberry, for the first time in those 39 years, has a vote on the board when it comes to setting policy for the organization. 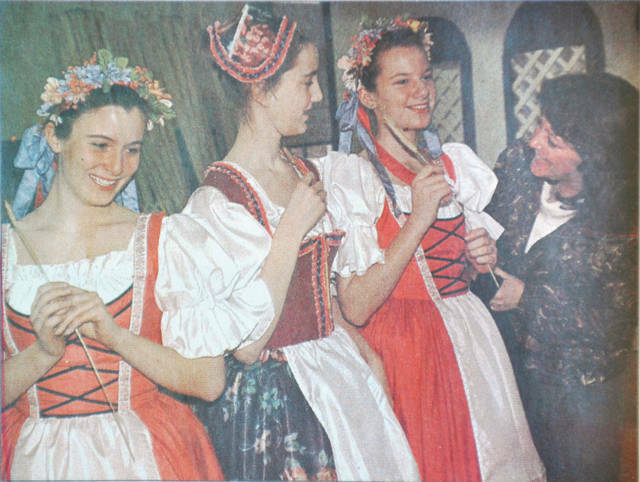 A 1974 graduate of Sidney High School and a 2003 inductee into the school system’s Hall of Honor, Eikenberry began her dancing career when she was 8, taking lessons in Bellefontaine. By the time she was a teenager, her mother was driving her to Dayton five days a week to lessons with Jo Schwartz, founder of the Dayton Civic Ballet (now Dayton Ballet), and its principal dancer, Bess Saylor. 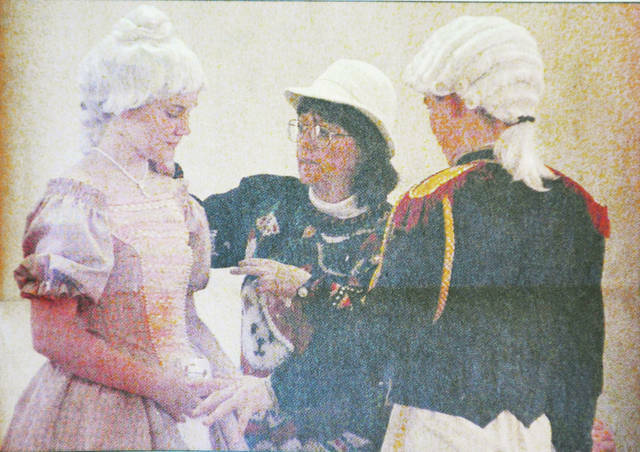 Eikenberry planned to be a performer, but also knew that one day, she would teach. “When I went to college, there were only 40 kids in my freshman class. I graduated in a class of nine. Of the nine, four had been in a youth ballet in Wisconsin. They had such an advantage when we auditioned. I told my mom, ‘When I start to teach, I’m going to start a ballet company,’” Eikenberry said. An auto accident cut short her ballet career, and she toured in musical comedies for three years before returning to Sidney to open a dance studio. It was Eikenberry’s mom, Kaye Arnold, however, who got the ball rolling for a performing company. And that’s when a tradition of olives began at the Sidney Dance Company. Arnold enjoyed drinking martinis and her favorite part was the olive. She included an olive among sugar plums and other fruits on the set for “The Nutcracker.” Eikenberry resisted, but Arnold sneaked it in. Ever since then, an olive has been hidden somewhere in every production but one, painted into a backdrop or added as a prop. “The kids always look for the olive,” Eikenberry said. The one production that didn’t have one, “was a disaster,” she laughed. Ice storms kept the audience away. In four decades, the director/choreographer has mounted hundreds of productions. Because her own dance career didn’t develop as she had hoped, she made sure to include musical comedies in the repertoire, as well as ballets. “Dancers needed to be more well-rounded, so we started doing musicals in 1984. That way, they could be a triple threat,” good at dancing, acting and singing, she said. Former dance company member Jill (Westerheide) Larger, now of Columbus, particularly appreciates that Eikenberry broadened the scope of the troupe. She began taking lessons at Sharon’s School of Dance when she was 3 and performed in her first Sidney Dance Company production as a munchkin in the “Wizard of Oz” as a seventh-grader. “My all time favorite was the musical, ‘Peter Pan.’ I was Wendy. They brought in a company to fly us. That was amazing, to fly across the Sidney High School stage,” Larger said by phone. She graduated from high school in 1994, majored in musical theater at Ball State University and now teaches theater, public speaking and broadcast journalism at Bishop Ready High School in Columbus. She credits Eikenberry with fostering her love of performing. “I always felt like home whenever I was in the studio. It just felt right. It was my happy place. Dance was fun and then it became a passion,” Larger said. She got discipline and tenacity from Eikenberry. “I learned my craft and the amount of time it would take to get better. She was adamant that we be at rehearsals. She not only gave me a love of dance and performing, but to respect it. She expected a lot from us,” Larger said. Eikenberry would not dispute that. “I’ve always believed I’ve taught more than a plie (a ballet move). When you’re in the company, you get discipline, leadership, disappointment. You have to work hard to get somewhere. It’s year’s of practice. It’s taking those dancers and giving them just more than they think they can achieve and then watching them hit it,” she said. The dancers weren’t the only ones who were challenged by the director. Parents and other volunteers who created sets and costumes were, too. “I’d say to fathers, ‘I need it to rain onstage,’” and they would figure out how to make it rain, she noted, adding appreciation for some professionals who also helped. “Mardie Milligan has done a lot of lighting for me. She lit in New York. I’ve got Marge Schell (who has created Dance Company costumes for some 20 years). She was costume mistress for Toledo Opera,” Eikenberry said. While she routinely challenged others, Eikenberry was also tackling her own challenges. There were two big ones in the beginning: Mentors in Dayton and other places told her that Sidney was the wrong place to try to start a dance company. “Shelby County can’t support what you’re trying to do,” they told her. But Eikenberry forged ahead. “We — Shelby County, Auglaize County, Miami County — have supported the Dance Company for 39 years. We have proved them all wrong. Our manufacturing here has been awesome for us. Emerson and Airstream have funded me when I needed it most,” she said. Her second challenge was educating the audience about what dance performances were. Many local residents had never before seen a ballet. A more recent challenge was a four-alarm fire in 2017 that destroyed all the company’s sets, props, tools and scrapbooks when it blazed through the downtown building that was the scene shop. It had also housed a ceramics store and an apartment. The fire burned for seven hours, and 80 firefighters responded to the call. “We’re still recovering. We’re starting over,” Eikenberry said, adding that millions of hours of work were lost. Reconstruction began almost immediately, but it has been a slow process. The third-floor scene shop has been refurbished, but tools still must be replaced. An administration area on the second floor is nearly done. “My prayer is that the community will come through again with their donations,” she said. Their teacher’s resilience and response to the catastrophe was just one more instance of company members’ recognizing what a strong role model Eikenberry has been. The teacher has always realized that she would have a big effect on her students. That’s one of the most important things Larger now passes on to her own students. “That we’re all different performers. To be safe and secure in exploring your own ways to perform. She never tried to get me to dance like someone else. To freely express yourself as a performer and not compare yourself to others. I just think she’s amazing. When I think of the core people in my life, it’s my parents, a professor and Sharon. I’m proud to say I studied under her,” Larger said. Eikenberry’s performers have gone on to be professionals in dance and theater companies across the country and on Broadway. They are also teachers, airline pilots, CEOs, accountants, lawyers and in many other professions. Their Sidney Dance Company director is proud of them all. She’s also proud of dozens of productions that have been done through the years. It was impossible for her to list a single favorite. “I didn’t have the male, and I didn’t have a corps of males,” she said. “Swan Lake” would have been another one. McFarland staged that one just a few weeks ago. Eikenberry has full faith in her protege’s ability to take the company to new heights. “I’ve got the lady to do it,” Eikenberry said of McFarland. “It’s great that I can have a vision and go for it. It’s nice having that freedom to run with it as I see it,” McFarland said. Eikenberry has not stepped completely away from her creation. The company’s second artistic director has invited its first to teach class whenever she wants to. And Eikenberry’s board position is that of production liaison. “That keeps me involved,” she said. As she transitions to her new role, she looks back at 39 years with gratitude. “I would like to thank the community, all my alumni and parents. They have been fabulous,” she said.